En esta segunda parte dedicada a la dimensión económica de la crisis de Irak, Elbay Alibayov analiza principalmente los desafíos derivados de la dependencia del petróleo, la ausencia de un entorno favorable a las empresas, el endeudamiento y el coste astronómico de la reconstrucción de las infraestructuras después de casi dos años de guerra contra el DAESH. The Iraqi economy is struggling. It fully depends on oil & gas industry and, thus, is exposed to market volatility and highly vulnerable. Today, oil exports comprise 99 percent of the country’s exports. This, combined with the old-fashioned central planning, strict market regulation, and outdated methods of management only makes the problem insurmountable. In charge is the Ministry of Planning, which also happens to be very influential due to holding the economic and social sphere information in their hands (and keeping it close to chest), a replica of (Soviet) socialist-style central planning committee. As across the Middle East, diversification of economy is a fancy word in Iraq, but: first, as shown elsewhere in the region, it is easy said than done, especially in a short time span (considering the external factors of harsh competition, but also internal human factor and the quality of physical and social infrastructures); and second, it requires not only well written strategies but concerted efforts and leadership by political elites (something that the United Arab Emirates have demonstrated in turning their economy from oil-driven to service-based, but Iraq, as some other oil-dependent economies, struggles to do). Non-hydrocarbon industrial production (or what is deemed as such) is concentrated in the Iraqi public sector. While comprising a tiny one-and-half percent of the country’s industrial units, state-owned enterprises (SOEs) are producing over 90 percent of the sector’s output. But even these SOEs are non-profitable: in 2012, almost 80 percent of them were functioning on the government subsidies. They use obsolete equipment, do not follow international technological standards, and are managed in outdated ways. Except for cement, fertilizers and transformers, the Iraqi industrial products from state-owned, private and mixed-ownership enterprises are not competitive at either domestic, regional or international markets. In spite of these striking deficiencies, there have not been any serious attempts undertaken towards market economy and deregulation, let alone privatisation. Economic reform plans have been developed by the Government (mostly with the assistance of international actors) but never transformed into action. The examples are numerous, from Integrated Energy Strategy, Industrial Strategy, to the Roadmap for Restructuring the SOEs and the Strategy for Supporting the Private Sector. Here, again, it was more about rivalry, vested interests of political blocs and lack of trust between them rather than inability or unwillingness of Government technocrats that did not allow making even initial steps towards deregulation or introducing mixed forms of ownership in key sectors. Business enabling environment in Iraq has been long neglected and as a result, remains largely underdeveloped and market-unfriendly (the Government’s ambition for and on-going negotiation on the acceptance to WTO notwithstanding). Private sector is weak and not supported by the effective policy, legislative and regulatory framework; to the contrary, there are thousands of laws, regulations and improvised circulars which only confuse and slow down the entrepreneurial activity, while creating conditions conducive for Iraq’s systemic corruption to thrive. It does not come as surprise then that Iraq is consistently at the bottom of the global ranking for Doing Business report: in 2015-2016, it ranked at 160 and 161 among 189 surveyed countries, respectively. Importantly, even within one year, it fell dramatically in a central category of ‘Starting a Business’ by 10 points. Otherwise, successful businesses are closely linked to political elites, thus feeding further the systemic corruption (such as those enterprises providing off-grid electricity to residential areas across the country, from their privately owned generators). About 95 percent of Iraq’s Government budget comes from oil revenue. Even at better times, any unfavorable fluctuation in oil prices had immediate and very painful implications on the country’s financial standing. As in many other areas, the Government and its Oil Ministry (another bastion of power and vested interest by elites) had been unprepared to the market shocks, because it had continuously failed to introduce modern planning and decision making processes (one such planning support tool, oil resource management system equipped with industry data software, was envisaged by the Integrated National Energy Strategy adopted in 2013 but by that time it was too late—ISIL was knocking at the door). In the last couple of years, the Government’s revenues have dried out due to record-low oil prices at the global market and the excessive spending from public budget, on the administration’s running costs, the war with ISIL and its humanitarian consequences. The budget has been approved for 2016 at $100 billion, with predicted deficit of about $25 billion. But even this grim outlook is unrealistic: the budget calculations were based on oil price of $45 per barrel, while so far Brent prices have been hovering around $30 to $40 (they are expected to average $42 per barrel in the second and third quarters of 2016, before rising to $44 in the fourth quarter). This means billions more added to the deficit. Five years ago, in 2011 the deficit was projected by the Budget document approved by Parliament at 16.2 percent ($13.4 billion to $82.6 billion budget, respectively), and this was at the time of oil prices keeping high at $76.50 per barrel. In a rather frantic move, the Government has recently resorted to using its foreign reserves (under a pretext of short-term measure) to cover its daily expenditures—and thus has taken a dangerous route which may head towards eventual insolvency. This will make the reserves fall from $59 billion in last October to about $43 billion this year. But that is not all. In the meantime, the Government is seeking yet another loan from the International Monetary Fund (IMF) in an attempt to regulate its financial situation. This is at the top of receiving $1.24 billion emergency loan last year (through the Poverty Reduction and Growth Fund). With another international lender, the World Bank Group (WB), the Government signed an agreement at the end of 2015, for a $1.2 billion loan. This also comes atop of other liabilities to the WB: by the end-March 2016, there were four active loans, through the International Bank for Reconstruction and Development (IBRD) and five credits through the International Development Assistance (IDA) – altogether about $3.1 billion already disbursed. Governments have stepped in, too: the United States has offered a $2.7 billion loan for military spending, and Germany has lent Iraq over $550 million for reconstruction. Looks like a lot money, but it is not. Altogether, these loans would barely cover the Government’s one-month administrative expenditure under the current circumstances, but instead will make Iraq more indebted, under mounting liabilities while with no repayment prospects on the horizon. The Iraqi Government simply cannot afford intensively borrowing. The borrowing from international lenders is always conditional, and it is proven helpful only in a short term as cash injection to maintain the equilibrium; while in the situation when government fails consistently to perform structural reforms, the financial discipline and austerity measures (let along being under the pressure of war and destruction of infrastructure and assets) the additional liability may turn disastrous and lead to the bankruptcy and the loss of sovereignty. What these attempts tell is more about the Government being desperate and confused rather than about well thought-out financial policy. 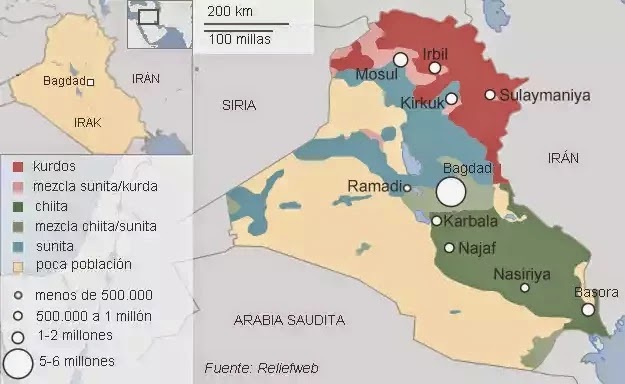 Another problem is that in order to get back on track and restore the normal economic activities, along with liberating the territories captured by ISIL, the Government will need hundreds of billions to be invested in the reconstruction of physical infrastructure (to revitalize what has been destroyed in the course of the last two years, by now). The cost of reconstruction has not been calculated yet. According to Iraqi economists, the country will need about $60 billion to recover. I think it is a very modest estimate: just recall how the U.S. Government initial estimate of $50 to $60 billion on the Iraqi war and reconstruction turned into $2.2 trillion by 2013. The international organisations and bilateral donors would step in, and so will do various public and private foundations and donor conferences, but the host government has to take its share of responsibility and match those reconstruction funds, which would be yet another challenge to the cash-stripped authorities. The question is, if the things (in this instance, the Government’s economic policies and practices) don’t change, can they stand to the task when the time comes? Esta entrada fue publicada en inicio, Norte de África y Oriente Medio y etiquetada Iraq, Norte de África y Oriente Medio. Guarda el enlace permanente.